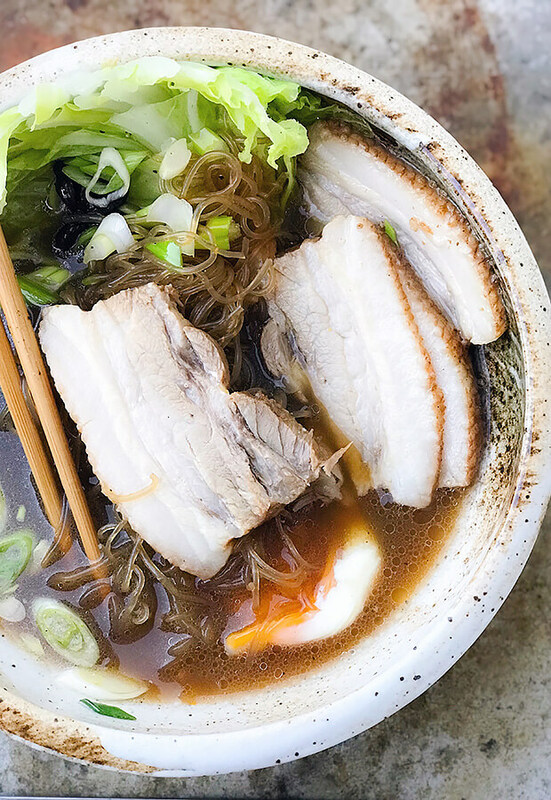 There is nothing more comforting than a bowl of hot noodles and this dish is umami-packed without the guilt of wheat! We are using kelp noodles. They are clear, thin, almost glass-like noodles. Kelp is a seaweed that is rich in iodine. 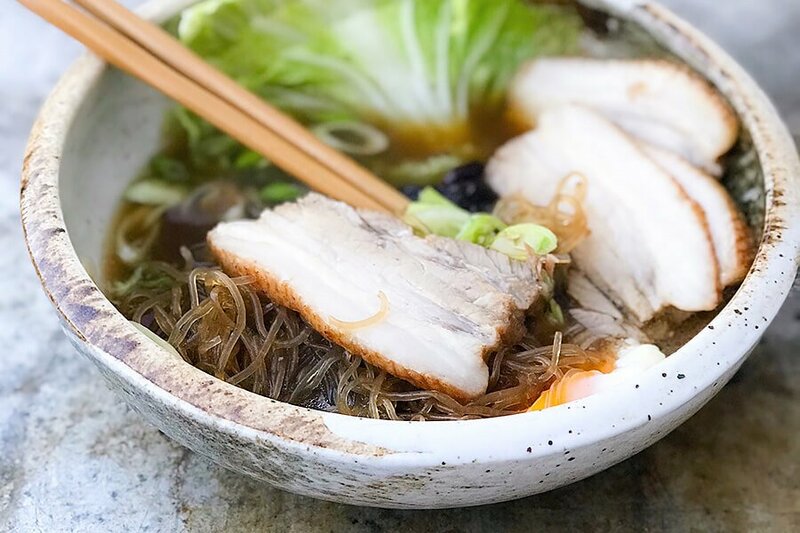 They are technically not noodles – think of it as a sea vegetable that is fat-free, gluten-free, and very low in carbohydrates. 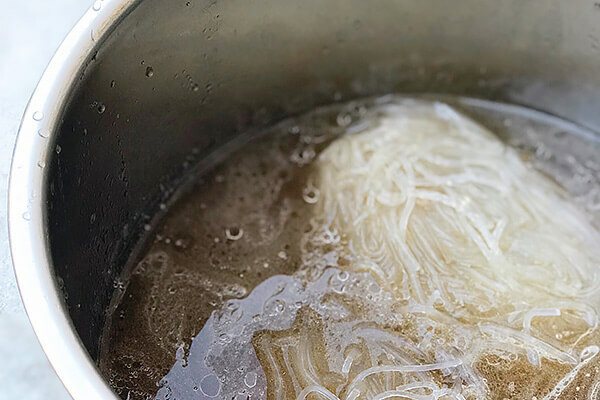 Because it looks like noodles, you may use it anywhere you would use actual noodles, think hot broths and stir-fries! 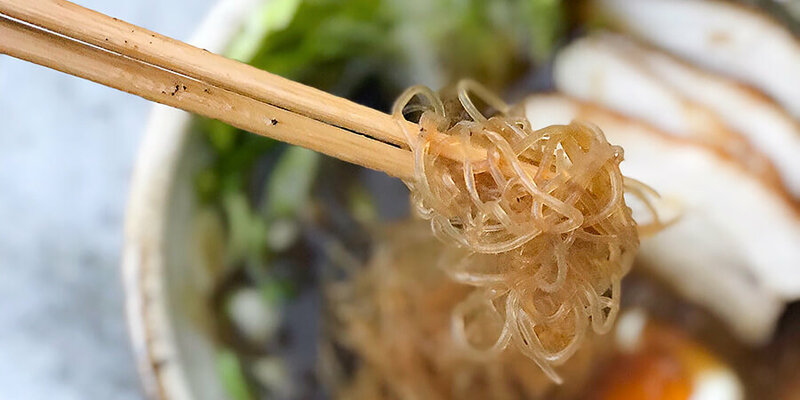 Kelp noodles are neutral in taste and have a crunchy, chewy, mouthfeel. I have yet to see them in stores, but they are easy to purchase online. 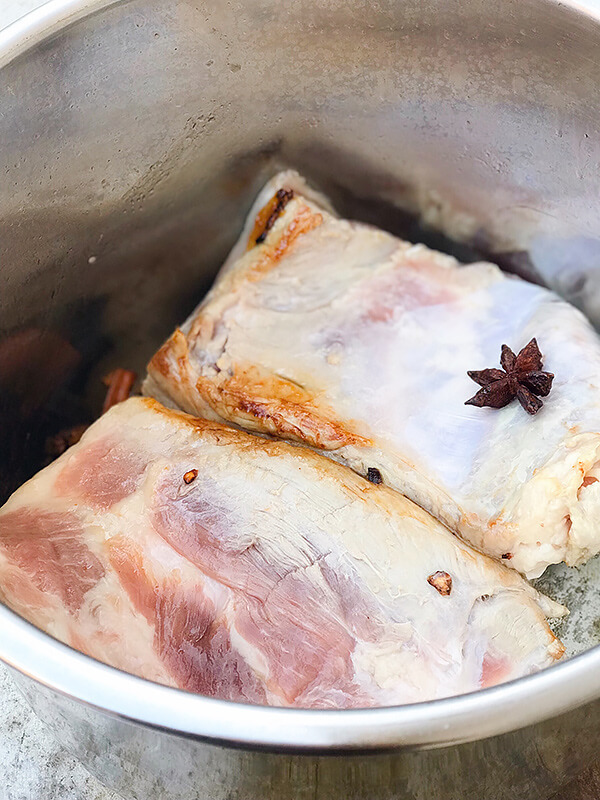 Braising the pork belly provides a flavorful base for our bone broth. 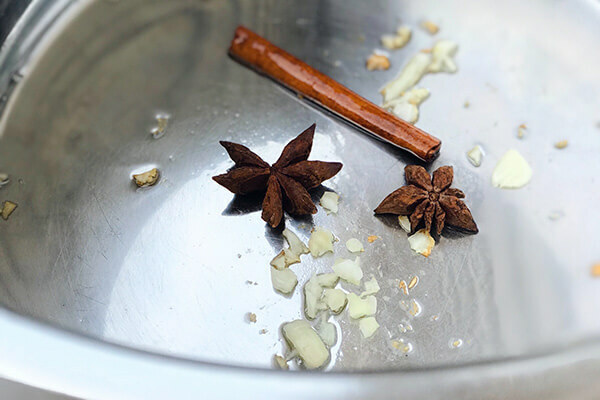 Typical of some styles of Asian cooking, we will be using a combination of aromatics such as ginger, cinnamon, and star anise for that licorice flavor. 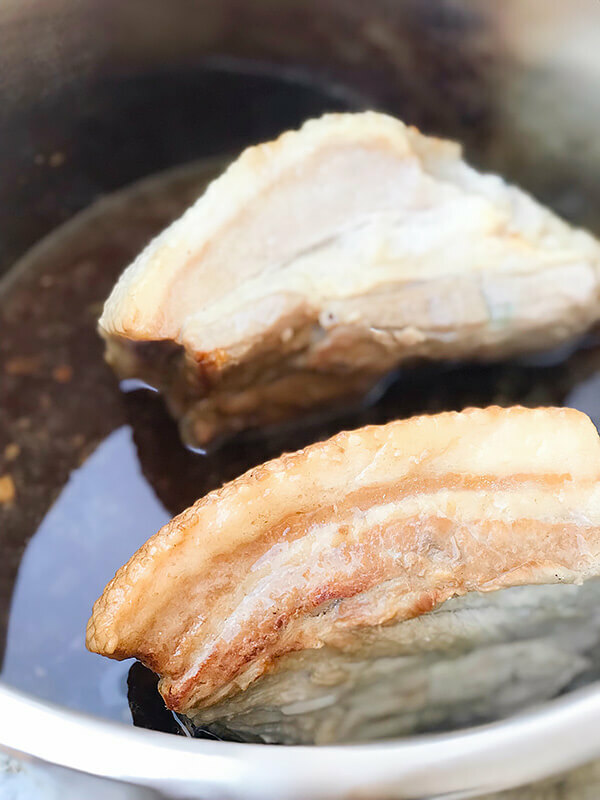 I used the InstantPot to make the braising quicker, but you may definitely do this on the stovetop. 1. 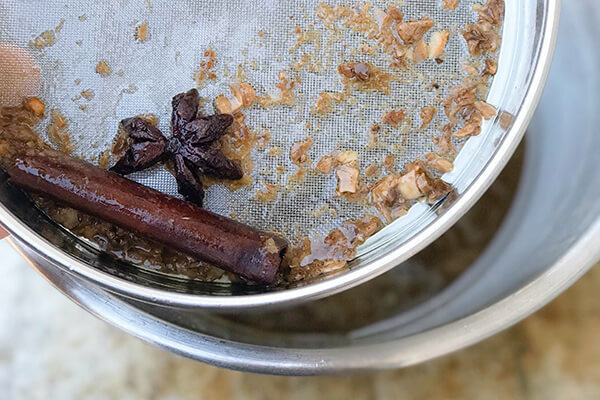 Using the “saute” function, heat coconut oil then saute garlic, ginger, cinnamon stick, and star anise until fragrant. 2. Add pork belly slabs and sear on both sides. 3. 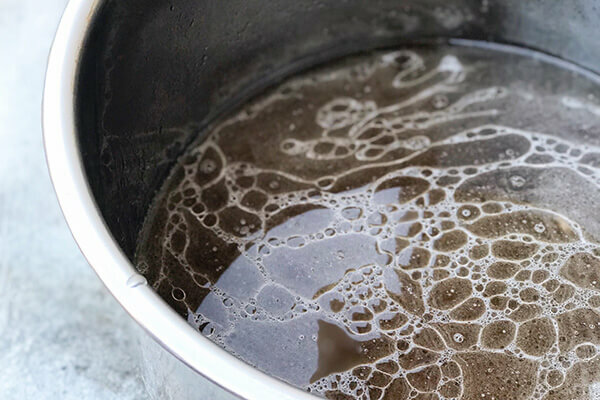 In a cup combine the soy sauce, brown sugar substitute, Chinese wine, and water. Mix until homogeneous. 4. Add to the pot. Close lid. Seal and cook on “high pressure” for 35-40 minutes. Alternately, if cooking stovetop, bring to a boil then simmer until tender for about 1 1/2 hours. 5. When the meat is tender, remove from pot and set aside. Meantime, strain the braising liquid. 6. Return braising liquid to the pot and add bone broth. Simmer until hot. 7. Ten minutes before serving, thoroughly rinse noodles, drain, and add to hot broth. This will allow the noodles to soften and separate. 8. 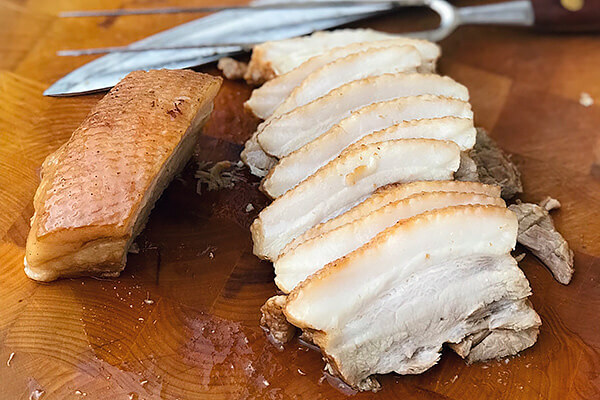 Slice the pork belly thinly. 9. To serve, place noodles in a bowl. Top off with broth. Add toppings such as cabbage, eggs, scallions, fried shallots (or garlic). This makes 6 servings of Braised Pork Belly Noodle. Each serving (without additional toppings) comes out to be 648.33 Calories, 62.9g Fats, 5.47g Net Carbs, and 14.68g Protein. Using the "saute" function, heat coconut oil then saute garlic, ginger, cinnamon stick, and star anise until fragrant. Add pork belly slabs and sear on both sides. 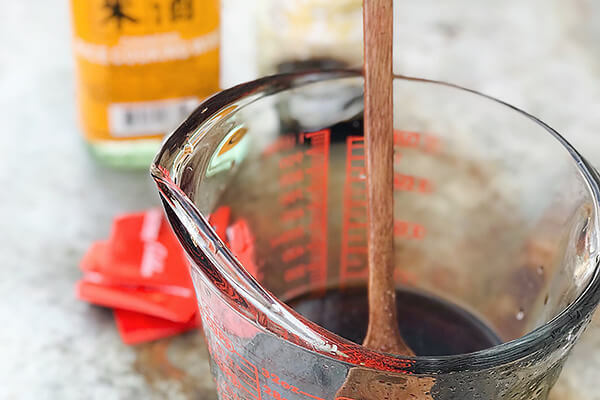 In a cup combine the soy sauce, brown sugar substitute, Chinese wine, and water. Mix until homogeneous. Add to the pot. Close lid. Seal and cook on "high pressure" for 35-40 minutes. Alternately, if cooking stove top, bring to a boil then simmer until tender for about 1 1/2 hours. When the meat is tender, remove from pot and set aside. Meantime, strain the braising liquid. Return braising liquid to the pot and add bone broth. Simmer until hot. Ten minutes prior to serving, thoroughly rinse noodles, drain, and add to hot broth. This will allow the noodles to soften and separate. To serve, place noodles in bowl. Top off with broth. Add toppings such as cabbage, eggs, scallions, fried shallots (or garlic).